It is with deep gratitude that we, Eugene Asidao and Nestor Nano, present this report. 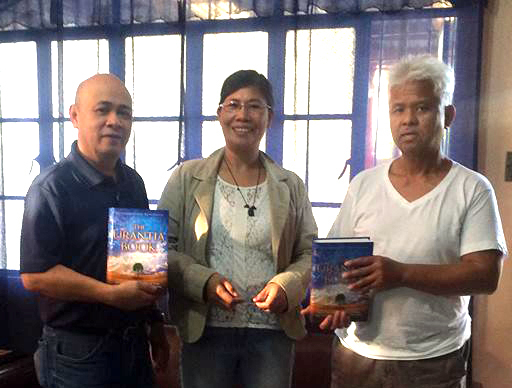 Thank you, dear readers, Urantia Foundation, and Urantia Association International for your contributions to our book placement project in the Philippines by donating 160 Urantia Books and for providing financial assistance. Without it, we would not have succeeded in our endeavor earlier this year. Let us provide you some data concerning the Philippines and how it relates to The Urantia Book. To our knowledge, the Philippines is the only Christian country in Asia. There are at least 98,735,000 Filipinos in the Philippines and another 10 million living in almost every country in the world. Out of the total population, 80% are Catholics and 10% are members of other Christian denominations. There are Christians in other parts of Asia, but only in the Philippines are Christians a majority of the population. There are two official languages in the Philippines, Filipino and English. The middle class, which is mainly the educated class, can speak and write in English. Therefore distributing the English version of The Urantia Book will be suitable in the near future. The majority of the population, however, will require a Filipino translation when the popularity of the book increases. Earlier this year, Nestor and I placed 142 books in libraries and with individuals in Manila and its environs. The remaining books will be given to individuals who express interest in it. The logistics of placing the books in libraries were quite challenging and time consuming. The traffic in Metro Manila is horrific! Renting a vehicle with a driver also posed problems due to our tight budget. Placing the books in libraries took time as well, but it was a pleasure. We had the opportunity to inform the recipients of what the book was about. Overall, the people who received them were very thankful. We believe that the ground in the Philippines is fertile for the seeding of The Urantia Book and its teachings. There are 2,180 universities and colleges and a vast public library system. We estimate an average of four libraries per 144 cities with even more in big cities like Quezon City, which has twenty libraries. We also have to foster the individual’s interest in the book by encouraging them to read it and form study groups. Facilitators are needed who are well versed in the teachings and who have the capability to organize and to teach. It is from the core of the study group that national interest will grow, and from there, the initiative of the Filipino translation will begin.